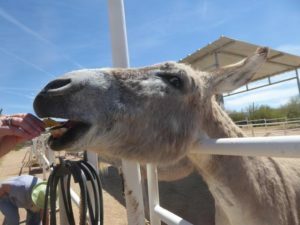 Yesterday some of the Beading Divas (Kate, Loren, Mary Jo and Karyn/blogging) took a field trip to Zen Donkey Sanctuary, our April fundraising recipient. Our contact Liz made the arrangements. We carpooled to her house in the far northwest and then she drove the 20+ miles (one way) to Zen. Since I was in the back seat, I had no idea where we were but registered Missile Base Road and we passed Ironwood Pig Sanctuary. Literally, it’s in the middle of nowhere. I love donkeys and goats and pigs and dogs. All species were present. We were invited to bring treats like carrots, apple slices, tortilla chips and peppermint candies to feed the donkeys. They were so gentle wrapping their teeth filled mouths around our outstretched hands. Sandy, who has been saving donkeys for decades, regaled us with mesmerizing stories about various donkeys and goats. She said donkeys are smarter than horses and can spot predators quickly. Their hearing is superior as they know her husband’s vehicle and can hear it a half mile away making welcoming noises in anticipation knowing that he is coming home. 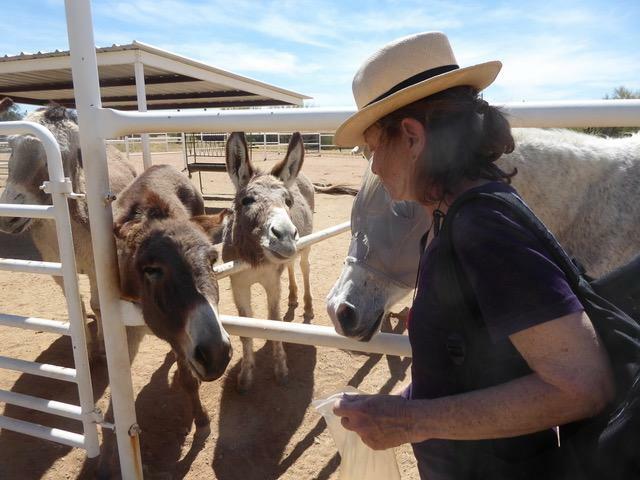 And the donkeys chimed in hooting and hollering for attention and more treats…and really, who could resist? Donkeys can also be adopted but not without much scrutiny, meeting the intended adopters, doing a home check even to another state to ensure a quality forever home. We asked about the expenses associated with running a sanctuary. For instance, a bale of Bermuda hay costs $15.50 and it feeds one donkey for four days. On the premises are at least a dozen donkeys, plus a horse or two, two goats, three pigs and about a dozen dogs including a sweet tripod pit bull who scrambled for the dropped tortilla chip crumbs. Sandy also mentioned to get a veterinarian to come to the property, the price starts at $250. The last vet call cost $800. Sandy has a background in healthcare and performs acupuncture and alternative treatments on the animals as needed. A fun time was had by all as we garnered donkey education 101. Then we went to Noble Hops to drink beer and eat lunch. Please consider buying a bracelet or three or making a direct donation. Follow Zen on Facebook. I cringed looking at how somebody was holding a treat for a donkey. Always put your hand out flat so you don’t get bitten by accident. 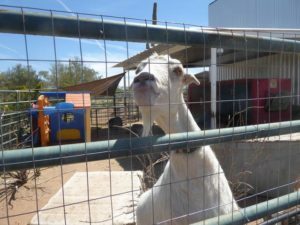 Beading Divas – Zen loved having you visit the sanctuary. The donkeys and goats are still looking for you waiting for more chips! Thank you SO much for selecting Zen Donkey Sanctuary as your charity for April.